Darkness has inspired fear since mankind first watched the sun go down. Bad things hide in the dark feral beasts with mouths full of razors waiting for a taste of flesh. But now, the darkness is stirring with a life of its own. Crescent Station is the last bastion of civilization, floating in the cold, outer systems where colonized space gives way to the sparser settlements of the Frontier. Like the boom towns of distant Earth s Old American West, Crescent Station is a gateway to power, wealth, and opportunity for anyone who isn t afraid to get his or her hands dirty. But deep within the station s bowels, in Crescent s darkest and most secret places, an ancient evil is awakening and hungry, and it threatens the very fabric of space and time. Will the residents of Crescent Station find a way to stop it before the terror drives them insane? Or is it already too late? This is the original Podiobook as released in 2007. We will send Crescent to your Kindle at . 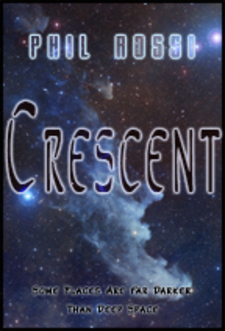 Crescent has been sent successfully to your Kindle!